In 1783 Sir Richard Arkwright built his impressive Masson Mill, just up the River Derwent from the existing Cromford Mill. Masson was a cotton mill, from bales of cotton to woven cloth, the only thing that didn’t happen here was any colour dying of the cotton thread. It was the oldest continually running mill in the world, finally closing in 1991. Now the old paper mill that stood next to the cotton mill is a shopping village, but the lower floor of the cotton mill is a museum, still full of machinery for preparing, carding, spinning, and weaving the cotton. When we visited one of the doubling machines was busy making string and some of the weaving machines from the 1800’s were started up for a demonstration. Just 3 machines were incredibly loud, a whole factory must have been deafening -apparently the workers had to communicate with sign language and lip reading. It’s a fascinating place; a building full of history, lost knowledge and huge equipment all powered by the river. Most of the machinery is no longer in use but this place was a part of the industrial revolution, this kind of machinery and factory system completely changed British production and the way people lived and worked. I find it really interesting but I can’t identify much of the machinery! From the top left: Jacquard looms for weaving fancy patterns using punch cards, a doubling machine, ‘the Devil’ cotton bail shredder, an 1800’s Lancashire loom, and part of the cotton preparation process. Masson Mill is located between Matlock Bath and Cromford in Northern Derbyshire and is open Monday to Sunday with 2 machine demonstrations each day. Go in the summer, it was freezing in March! I recently took part in my first proper sewing swap on Swap-bot! 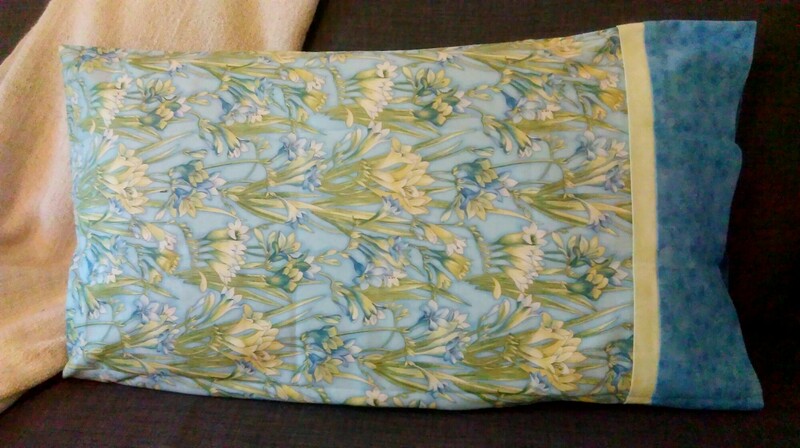 The swap was for an pillowcase using a simple tube method with 3 fabrics. The instructions in the swap directed us to this video, but I think there’s plenty of similar instructions out there. My swap partner likes pink and red, so a raid of the fabric stalls in the market produced a couple of nicely contrasting patterns with similar colours. I used a wide woven ribbon for the small strip of fabric because it coordinated better than anything else I had. I also added some text detail with freehand machine embroidery. And French seams too! I was really pleased with how it looks. I was a bit uncertain about the size of the pillowcase, it seemed really wide for my pillows, but my swap partner was really happy with it 🙂 and the pillowcase I received is a similar width so it must be the design. Are American pillows wider than UK pillows?! I’m looking forward to finding my next sewing swap now! Today seems like a good day to share my photos from last Saturdays trip to London. 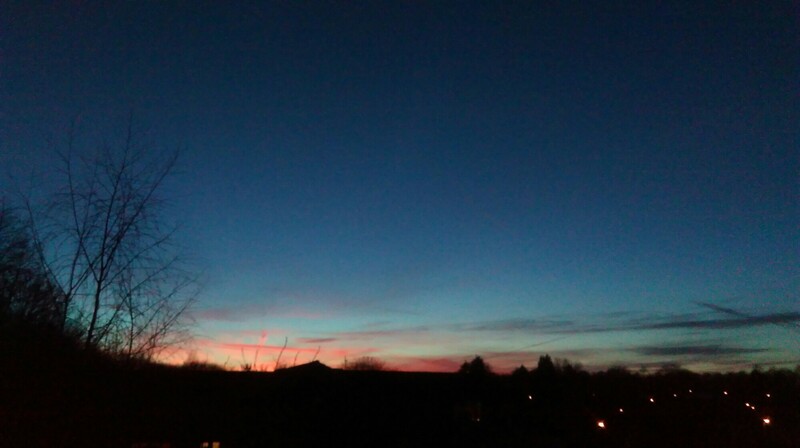 My brother lives down there now, and although it’s not a cheap journey it’s only 1.5 hours to get there and it’s slowly occurring to me that it doesn’t have to be a major event to go to the big city. Yesterdays news was heartbreaking and incomprehensible, like all such events. I can’t stop myself from feeling a little nervous but I refuse to let a few hateful and destructive people stop me from enjoying living and travelling. London is a wonderful city to explore and with my irregular visits there’s still so much I haven’t seen, so I’ll definitely be heading back soon. And out to see the world too, I believe there’s still a lot of good out there. From the top: view over Greenwich to Canary Wharf, Buckingham Palace from St. James Park, Big Ben viewed from Westminster Pier, the Tower of London, the Shard, and Tower Bridge. Conspiracy theories and advice welcome! A couple of recently arrived letters have had me a little puzzled, for very different reasons. The first puzzle is what on earth happened to this letter?! The second puzzle is more of a social dilemma – what do I write letters for and when should I stop? 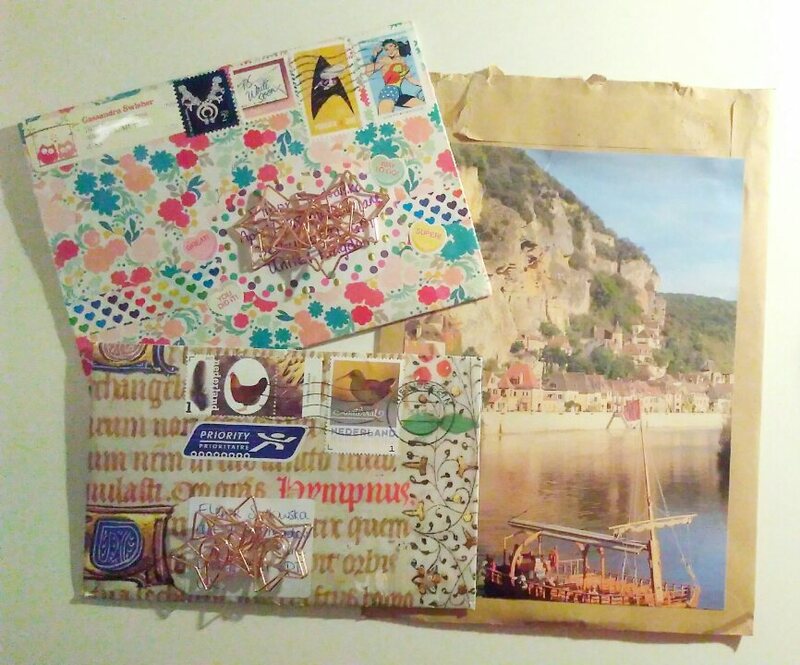 In more cheerful news, look at these lovely homemade and decorated envelopes 🙂 All awaiting reply…so that’s tomorrow’s entertainment sorted! 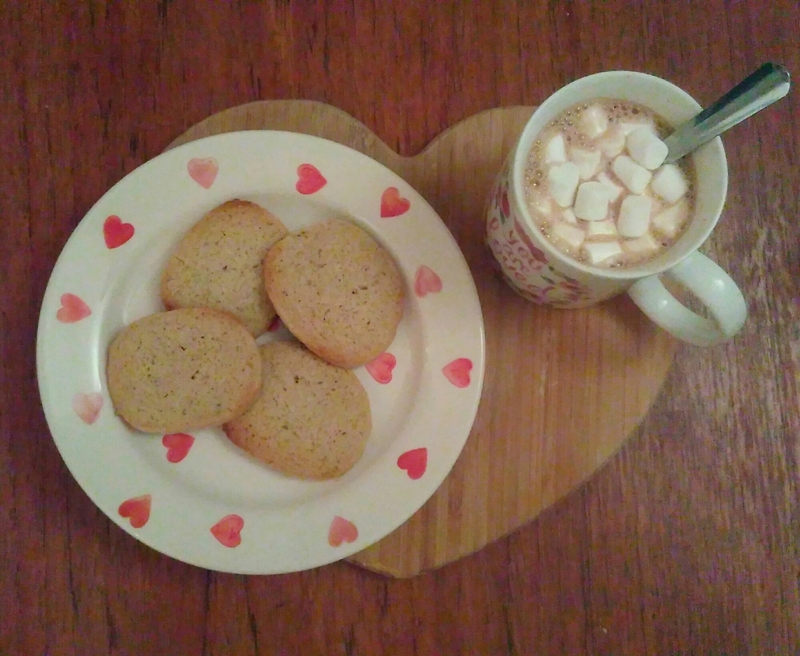 It’s been a while since I did any baking, but I’ve given up milk in all things for lent (with slight exceptions for a few social events and a holiday because I need a social life and a trip away too much) and the main things I can’t get around are sweet things. I went to a cafe and missed out on cake! I am truly making sacrifices 🙂 There are some dairy free options in the supermarket but they’re primarily gluten free and often a little odd so I decided to take action – with dairy free spread instead of butter obviously. 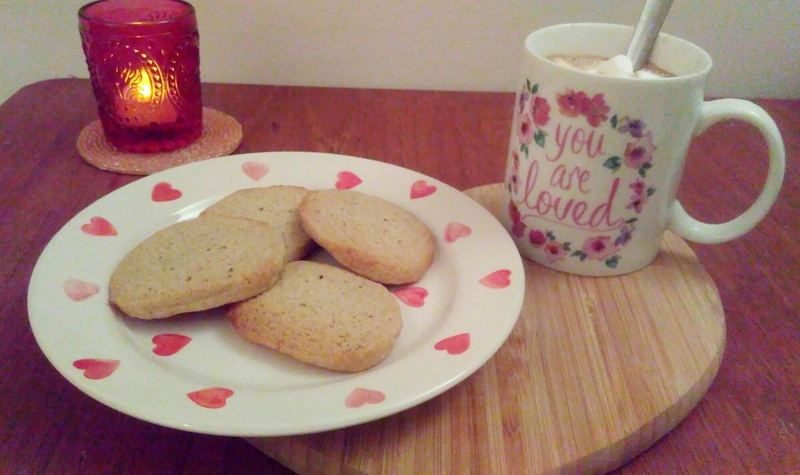 I’ve posted about these type of biscuits before, they’re a really easy way to keep a stash of ready-to-cook deliciousness. I made the last large batch at the start of October and they were finally finished in mid-December. Also useful if there’s only one of you who would otherwise have to eat all of them within a few days or (the horror of it) share them. I last made some to this recipe, and recently discovered this recipe from A Beautiful Mess for a vanilla and thyme version. I used rosemary because in my kitchen it was that or Herbes de Provence… I also made a second batch with honeycomb pieces. They’re all delicious but this time I’m finding it much harder than I remember to slice the dough when the biscuit logs are straight out of the freezer. The recipes are very similar (and both taste really good) and the only difference I can see is that the second recipe contains slightly more butter – I don’t know enough about baking to know if it could make the difference. Much defrosting to soften it and I’m finding the dough becomes sticky and squishy. Once I’ve munched my way though this batch I’ll try the other recipe again for a comparison. 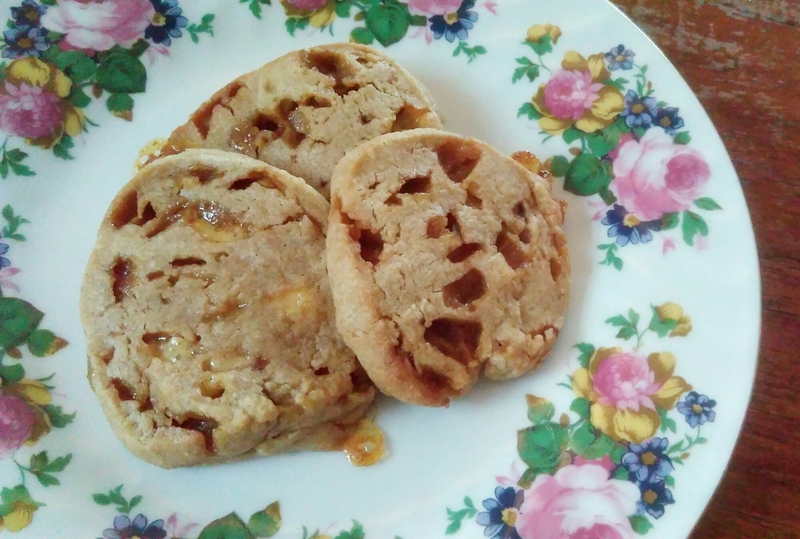 Slight issue with the honeycomb pieces – they caramelise and leave gooey holes in the biscuits, but also create toffee like patches so no complaints! For the vanilla and rosemary version I used a mix of vanilla sugar, ground vanilla beans from a little pre-loaded grinder I have, and vanilla essence. All together it smells and tastes great! It’s not a flavour I’d have thought of but the delicate herbal taste is lovely and very moreish. So Friday night (24th Feb) I did a load of of letter writing and swap sorting, spent a small fortune on postage of Saturday, had visitors on Sunday, then woke up on Monday and decided I really wasn’t well enough to do things like get out of bed. Probably explains my tiredness for the past week… But I have just about posted an item every day this month, with a couple of delays and make up days. 25th – My final item for the swap-bot ‘month of happy mail’ swap. 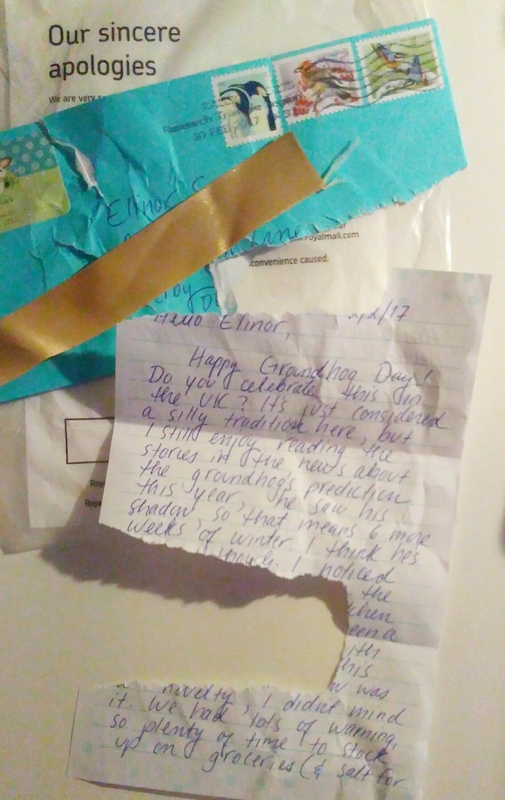 I made a weeks worth of positive notes and little gifts – 7 notes and gifts individually wrapped. It’s based on another swap I once did and really enjoyed. 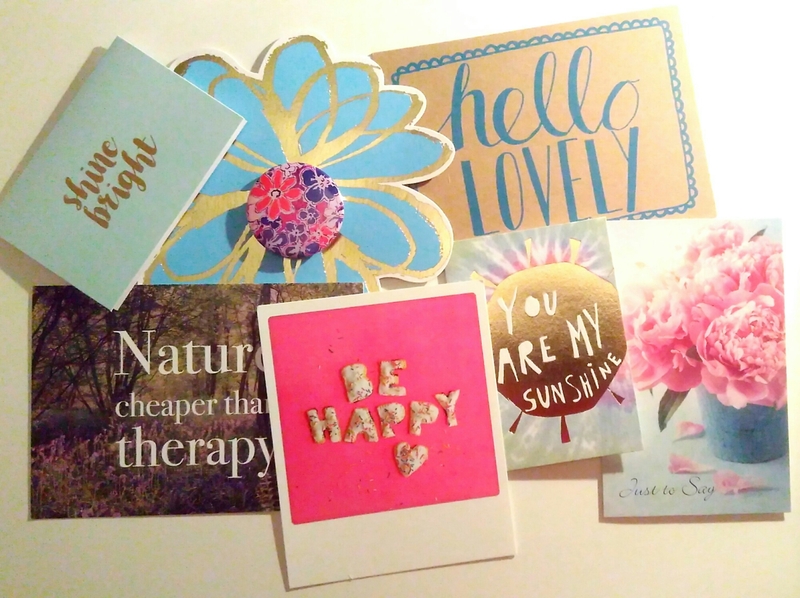 I wrote a few nice quotes and some hopefully cheerful notes on a variety of postcards and note cards, then put each note in separate envelopes with a little wrapped gift. 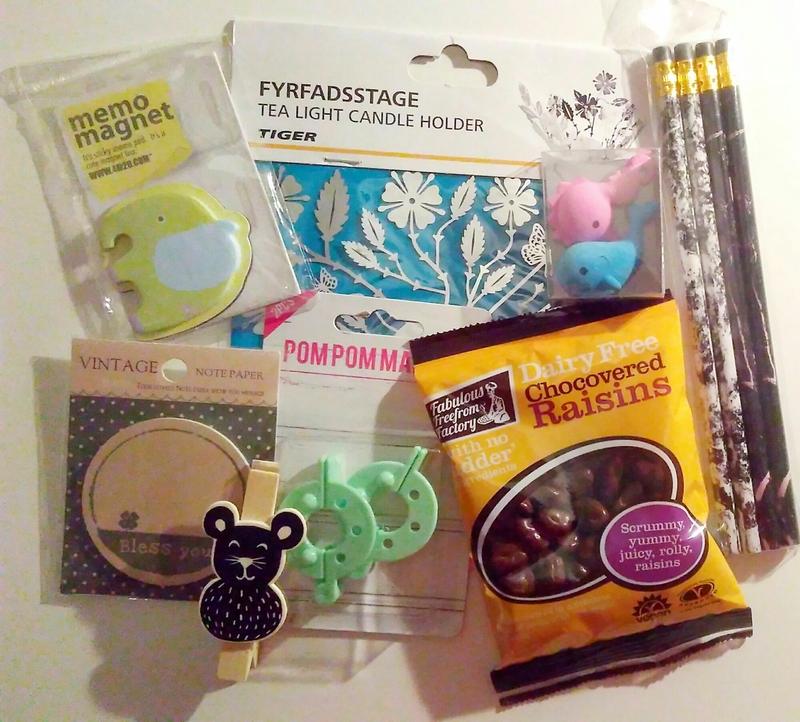 I raided my little gifts stash, I hope they enjoy everything. I did forget to pack the chocolate raisins so I’ve eaten them instead! 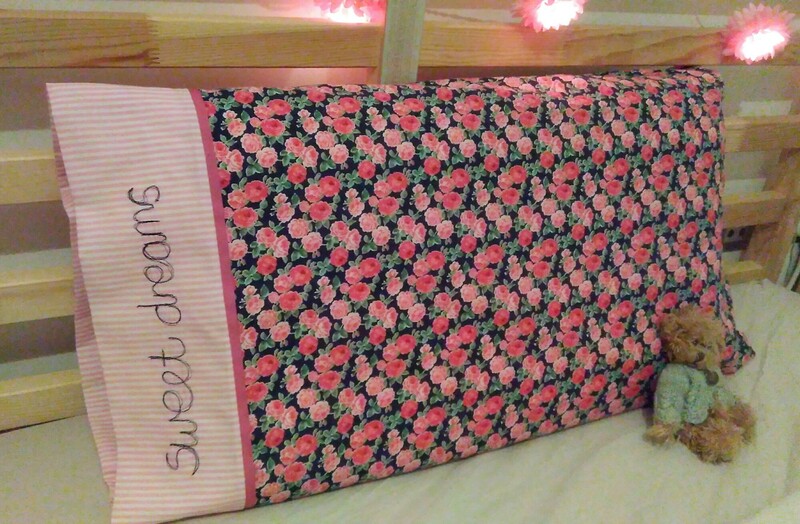 26th – Technically posted the day before, I sent off a swap for a homemade pillow case. I’ll post about it separately soon. 27th / 28th – I started to recover from my cold/ flu type thing to realise there’s 3 birthdays coming up in the next week or so! 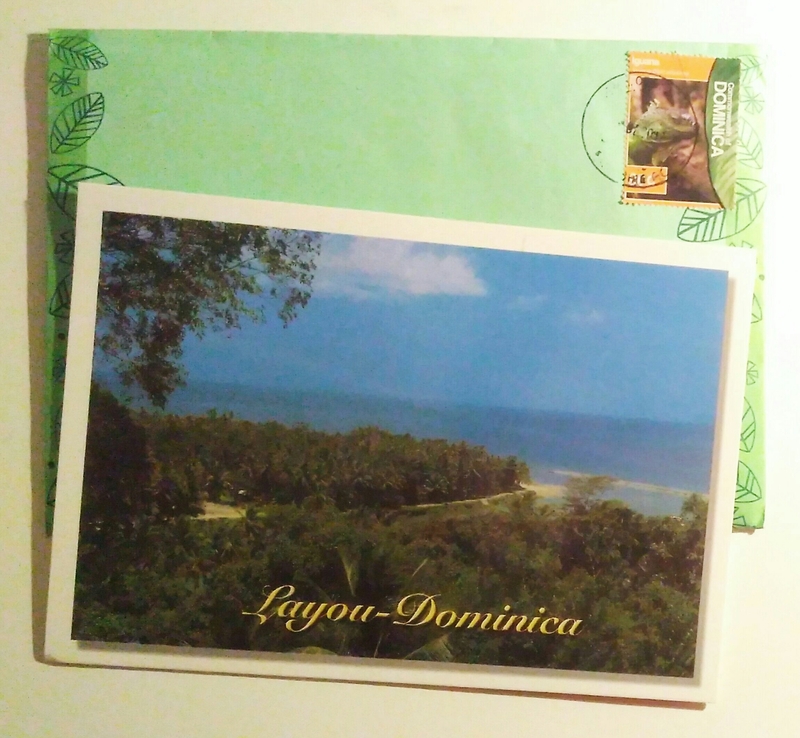 So I dug out a few cards, and added a little gift and letter to one to a penfriend. There’s only 1 I’m fully confident will arrive in time! In February I’ve posted 31 items to 10 different countries – UK, USA, India, Netherlands, Slovenia, Italy, Germany, Russia, Turkey, and Australia. I’ve spent £47.32 in postage. I have one letter to write still outstanding that I feel a little guilty for being so slow to reply to, but it’s a first letter and I want to do a good job of it. I don’t as fully track incoming post, just enjoy it and blog about it occasionally, but I’ve had a whole mix of stuff. I don’t think I’ve received more than normal despite sending nearly every day, but maybe that benefit will come as replies over time.